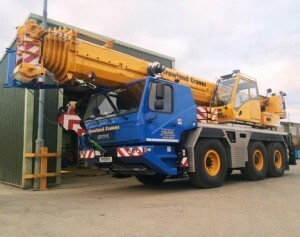 UK rental company Crowland Cranes has added a 60 tonne Grove GMK3060 to its fleet. The crane follows the first four axle 100 tonne Tadano ATF100G-4 in the UK delivered in January. The GMK3060 was handed over to Paul Bishop, Crowland Cranes hire manager at its Peterborough depot by Jerry Welford of Manitowoc UK. “The GMK3060 was chosen because we already operate a GMK3055 which has proven to be a reliable taxi crane, and the GMK3060 has had a nice facelift with a larger counterweight configuration and increased load chart which fits nicely in the 60 tonne range that we currently operate whilst still remaining a very compact three axle machine,” said Crowland’s Pete Issitt.